Our factory operations are supported by our continual reinvestment in equipment and machine tools, which enables us to maintain very tight control on our part manufacturing. This translates to more predictable and successful performance of the final products once they’re installed. A significant portion of our business is with the US Navy, directly and indirectly. 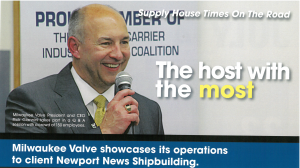 As a result, the highest possible quality standards that our Navy requires for the valves they buy are applied throughout our operation to everything we do. Because of our long-standing position as an important supplier to the Navy, they have trusted us with several key high tech development programs for the newest generations ships and aircraft carriers now being made, something that further distinguishes us from our many competitors.